I have booked a Suite in the Dury hotel attached to the Convention Center.. We will be hosting a Pinside Meet and Greet up in the hotel room Friday Night 9-11pm (later if we can get away with it) We will have Atleast a couple of Pins up there, Food, Beer, Wine and other drinks. Come Join Us! I will post up in this thread and also edit this posting with the room number as soon as I have it. Looks like we will have a Ironmaiden pro and maybe cyclops with rear it’s one eye again! Just maybe. This is open to anyone who wants to come. The more the Better. Do me a favor and post up in here if you are coming just so I know how much food and drinks to get! As long ask the hotel does not throw us out will be back at it Saturday night too! Look forward to Seeing many of you again, and meeting other of you for the first time. Should be a great show! I'll stop by with the wife if we're not too tired to stand up by then! Thanks for setting it up! Oh cool! This is my first show and I'll just be arriving that afternoon (no pinburgh for me) but I'll try to swing by. Don’t worry I’m not playing either. Will be there Saturday as well! So you are out of excuses . Sorry I won't be there to help with the shopping again, JJ. Good luck! this was awesome last year! im in! Thanks JJ! Grab us on the way! Will try and stop by! Sounds like fun! I’m at the Drury, so I’ll definitely stop by. 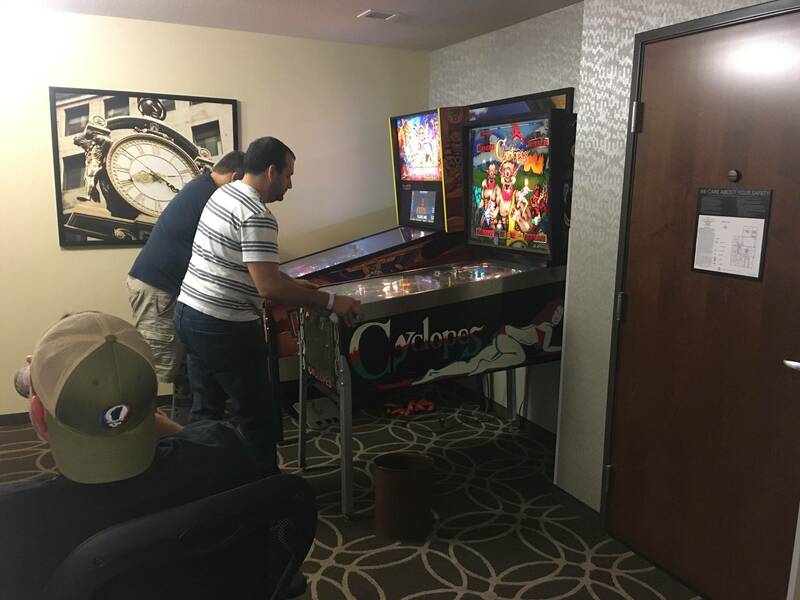 More pinball after two days of Pinball? Sure! If my feet and back hold up well enough I'll be there. Will there be police ? There were police at the Ramada after party at York. That was fun. The bar has been raised JJ. Going to do it again tonight! Got a ton of beer left over! Will definitely try to make it tonight. Was my first here last night and got caught up in all the awesomeness! Thanks again JJ for your hospitality. Gexchange knows how to throw a party! Thank you for your hospitality and for having an IMDN Premium for everyone to play! And the Cyclopes too! thanks JJ was awesome as always!